I lay down in the forest on the thick winter brown leaves to communicate with the spirit of the land, the rounded mountains. I asked to be see how it is. I was shown deep red rivers running down the mountain sides. Tree roots twining and bifurcating from the banks, expanding and plaiting, forming bridges across the red. Then under the rivers, more red, warm, covering the countryside. And deeper still, the fire. I was told that the volcano fires were close, too tight with energy. I asked if there was anything I could or should do. The spirit of the land asked me to unwind some of this energy. 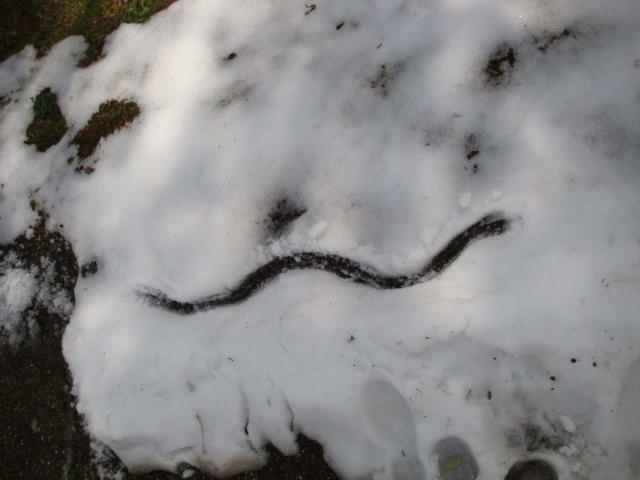 Later, in the snow covered patches, I uncoiled the energy by teasing out a serpent in the snow. My intention was to gently let go some of the tension caught up in spiral. Transforming serpent softly melting into our earth.